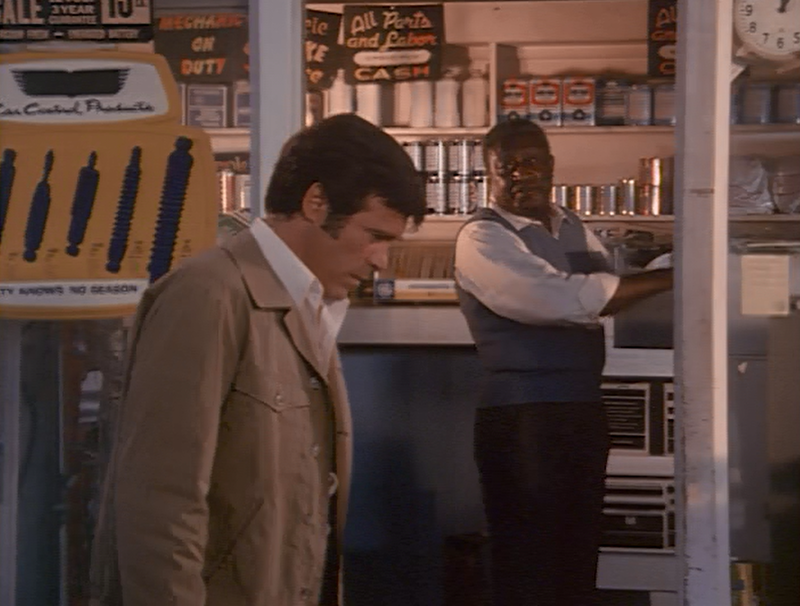 In “The Return,” Ben Richards (Christopher George) returns home to the small town where he and his brother, Jason, were raised after leaving an orphanage. 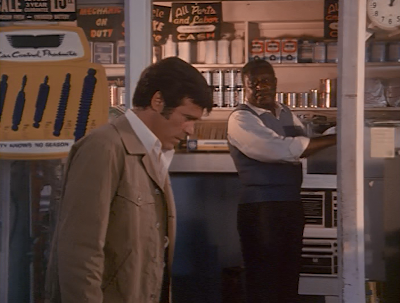 Their adoptive father is Joe Carver (Richard Ward), an African-American man who owns a gas-station and auto-shop. Joe is happy to see Ben again, but has no information on Jason’s current whereabouts. He is also hurt that Ben has not visited him for six long years. Soon, Joe is accused of assaulting a white boy, Steve -- the son of his best friend, Roy Adkins (Harry Townes). The boy will not survive his injuries, according to Dr. Arliss (Ted Knight), unless Ben can transfuse him with his special blood. Joe refuses to talk about the incident, or defend himself from legal jeopardy. But he is not a violent man by nature or inclination. Ben stays in town to learn more and help Joe, but Fletcher (Don Knight) and his newly hired mercenaries know where he is. Fletcher insists that “emotions are every man’s worst enemy,” and proceeds to capture Ben. Ben escapes from custody after shrugging off the effects of a tranquilizer dart, and learns the truth from his adoptive father. The boy, Steve Adkins, wants to marry Joe’s daughter -- Ben’s adoptive sister --Carol (Marlene Clark), and their discussion about it grew heated. Steve fell and injured his head in the accident, so Joe is innocent of assault charges. The Adkins and Carver families reconcile as Steve recovers, and Ben must head on his way with a final gift from Joe: a car to drive on his cross-country travels. On one hand, it is rewarding that Ben Richards’ youth and background is examined in “The Return.” It is also refreshing that the episode takes such a progressive view of family relationships, and reveals that Ben is the adopted son of a black man. On the other hand, however, this installment still feels a bit like the formula, with Ben showing up in a town, saving a life, solving a problem, and the story raising a social issue. Still, credit where credit is due: it was a courageous choice in 1970 to have the lead protagonist of a series be from an interracial family. Today, I hope we don’t look twice at an arrangement like this, but such family relationships were not the norm at the start of the disco decade. 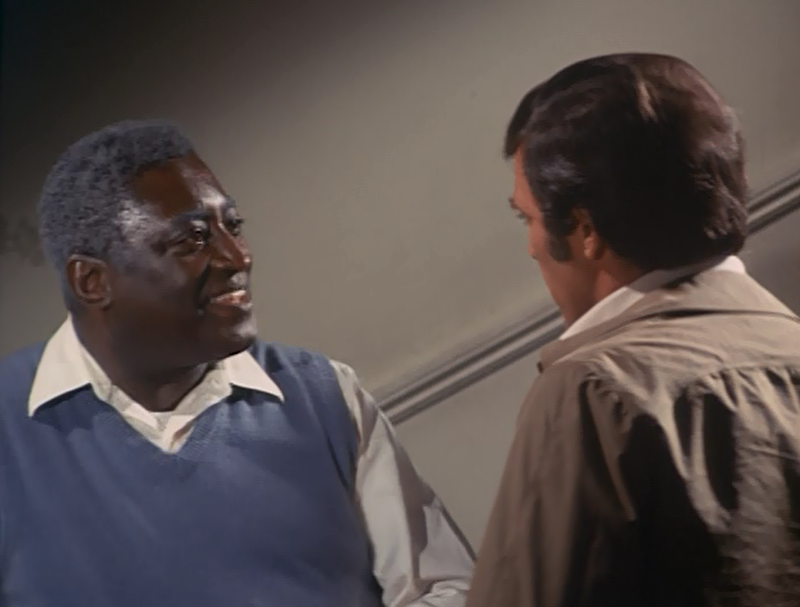 Consider, this episode aired years before All in the Family premiered, and brought discussions of race (and racism) part of the national conversation. 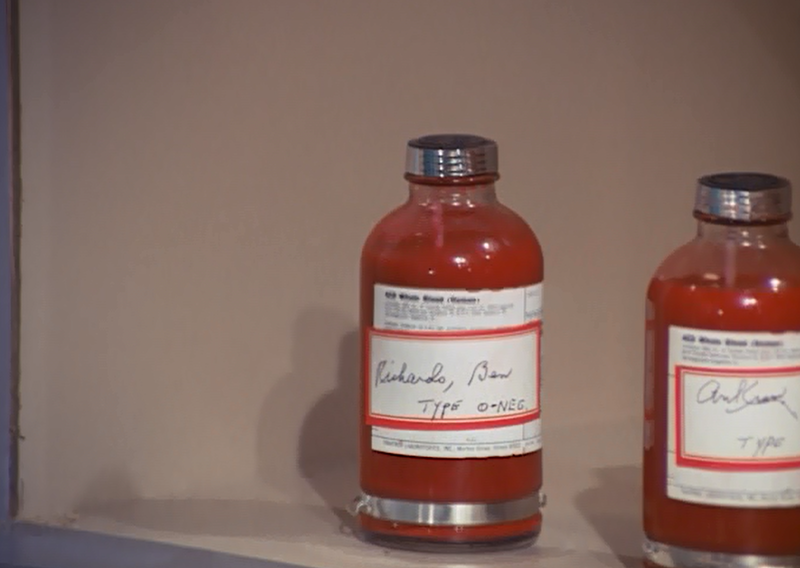 The social currents in the episode are fascinating to watch, by today’s standards. Joe has spent his life as a crusader for African-American equality and civil rights, and he experiences a burst of anger when Steve calls him an “Uncle Tom.” We get this story from Joe, but sadly, the episode doesn’t have the courage to show us that scene. In fact, the interracial lovers -- Steve and Carol -- don’t have a single scene of dialogue together. He’s comatose in the hospital, throughout. So, the story gets credit for tackling an issue -- interracial tensions and family dynamics in 1970 America -- but the way it tackles that issue isn’t always great. I will say this, the episode offers a strong depiction of Joe Carver, as a man of integrity and morality, who finds himself navigating unexpected and surprising territory in his family. Outside the central story, Fletcher gets a larger-role than usual in “The Return.” The episode begins with him briefing his mercenaries about Richards, and about the belief that he will return to his childhood home, because he is hobble by emotions. 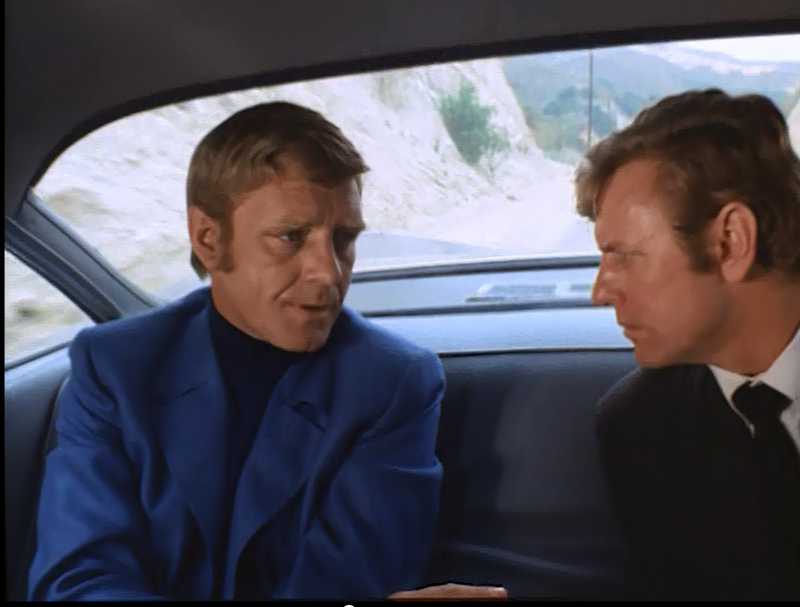 Later, he and Richards interact more here than they have since the very first episode of the series, following the pilot, “Sylvia.” At one point, Fletcher dons a blue jacket, and with his short 1970 haircut looks a bit like Ed Straker from Gerry Anderson’s UFO. But back on point, Fletcher discusses how emotions hobble Ben, and make him easy prey. His theory is proven true, as Richards risks everything to help the man he considers his Dad. This material all works fairly well, since Ben isn’t always emotionally invested in the encounters of the week. On the other hand, it is odd that Fletcher doesn’t appear in the latter half of the episode, to continue his pursuit of Richards. He captures Richards. Richards escape. And then Fletcher disappears, even though he knows exactly where Richards is headed (back to Joe). At least there’s no romance shoe-horned in this week. Finally, I wonder if this episode was produced early, and held back to be aired later in the season. Some of the chase scene in this episode is excerpted in the opening credits each week. "Hey Joe, sorry I almost shot you just now. Are we still on for poker at my place this week?" There were shenanigans aplenty in "The Return," from Fletcher's gloating, goading an unrestrained (!) Ben into punching him in the face, to the questionable usage of the phrase "Uncle Tom" (which would've been more applicable had Joe let Steve marry his daughter). But darn it, once again, "The Immortal" pulls you in and doesn't let go. You forgive its faults because it's just so suspenseful, so lush in its surroundings, so earnest in its performances. I also appreciated the message the episode was trying to convey, as written by the series' creator, Robert Specht. I will confess at this point in the series to having been so jaded, that I was wondering which woman Ben would have his way with this week: Mrs. Adkins, or the Nurse? Also, it's hard for me to watch Ted Knight without thinking of that immortal quote: "The world needs ditch diggers, too!"